Somewhere in that next section up, more near the 2nd thin line up from where the sun is now on the map. I think it's too far north and not close enough to the equator. Okay how about here? Is this where you would like it? That looks OK. About as close as I can come from what I've seen from the pictures and direction I saw and me not know exactly where the sun is at this time of year. But yes, let's just go with that. I think this picture here show HOW the sun lights the earth in FE. The bottom image in the box. I think this picture here show HOW the sun lights the earth in FE. The bottom image in the box. Everyone could see that on a flat earth. There is also nowhere for it to go at sunset or to come from at dawn. And btw, @Sherman - I'm not mad or "angry" and I will have no problem saying I'm wrong if that time ever comes in my lifetime. I don't even consider winning or losing. It's not a contest or even about debating style etc. It's about spreading the possibility of FE. Readers can see which side the anger is coming from. You are right, it's about truth, not winning. The sun doesn't stay the same height in the sky over 24 hours. It rises and dips as seen in Alaska at times etc. FE will never 'win', by the way. The scripture says that all the world will wonder after the beast. The grand alien deception, which they may use to explain the rapture of the Body, will deceive almost everyone. Have you noticed how many movies are about aliens and otherworld creatures coming to earth? We are bombarded. They are priming the public to accept the deception...a deception which cannot happen on a flat earth. A vast ever expanding universe is necessary. Challenge yourself to look for holes in your argument...until there are none to find. "The whole world" wondered after "911" - thanks to the global reach of modern media. "The whole world" wondered after the phenomenal fame of Michael Jackson - thanks to the global reach of modern media. I rest my case, mr mantra. 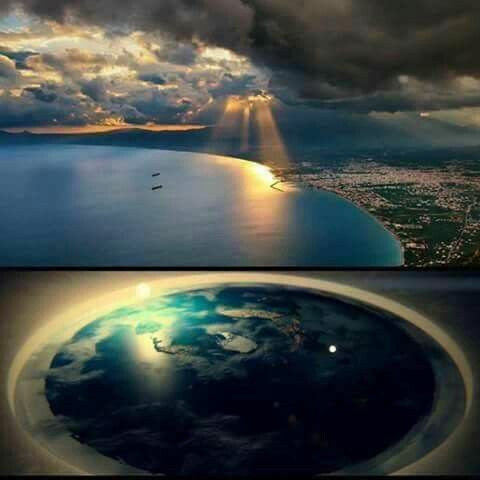 Hey Patrick the bottom image is from a vantage point thousands of miles away from the flat earth. And we can clearly see the sun. Why can't people on the opposite side of the flat earth see the sun? That looks OK. About as close as I can come from what I've seen from the pictures and direction I saw and me not know exactly where the sun is at this time of year. But yes, let's just go with that. Okay. I will go with that. Now we need to chart where the sun light is hitting the earth from that location. We know that the line MUST intersect my location from yours and Clete's. That makes it very easy to chart. The circle of light is based on the center of the location of the sun and finding the edge knowing that it's light in Denver yet pitch black in Houston and St. Louis at the exact same time. At least, it's broken on mobile haha. I think that works although the real life sunlight wouldn't form a perfect circle like that and SOME light would be illuminating beyond that circle in a wider swath.